The First Epistle to Timothy is one of the three Pastoral Epistles, originally attributed to Saint Paul and part of the New Testament. Timothy occupied a position of considerable influence and authority in Ephesus (in modern day Turkey), and was reportedly much loved by Paul, who was his mentor. In the epistle, Timothy is carefully instructed on how to carry out his duties, such as conducting worship, the organization of the church, dealing with false teachings, the role of women in the church, the encouragement of members not to lose their faith, and the other responsibilities of bishops and deacons. 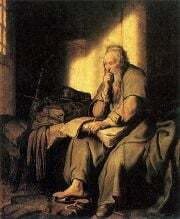 Paul writes an epistle from prison, near the end of his life. While Paul is traditionally recognized as the author of 1Timothy, a more modern view is that the letter was composed many years after Paul's death by a churchman who honored Paul's memory and invoked it to help the emerging church solidify its tradition and authority. The letter serves as a basis for upholding a hierarchical church order and forbidding women to serve as Christian teachers or ministers. Whoever the real author of the letter is, Paul and Timothy were historical people in the relationship of mentor and student. Paul refers to Timothy as his assistant, "fellow worker," and sometimes co-author in several of his recognized authentic letters such as 1 Corinthians, Romans, and Philippians. Timothy is first mentioned in Acts 16:1. His mother Eunice and his grandmother, Lois, are mentioned in 2 Tim. 1:5. His mother was a Jewish Christian and his father was Greek. Timothy first met Paul during Paul's second visit to Lystra (2 Timothy 3:11; 2 Timothy 16:2), where it seems he was converted during Paul's first visit there. Paul, having been impressed by his "own son in the faith," made Timothy his companion (Acts 16:3) and mentored him in Christian leadership. Paul and Timothy did missionary journeys together, in Phrygia, Galatia, Mysia, Troa, Philippi, Berea (Acts 17:14) Athens, Thessalonica (Acts 17:15; 1 Thessalonians 3:2) as well as Corinth, Macedonia, Ephesus and greater Asia. Timothy was also noted for coming to Paul’s aid when Paul was put into prison (Philippians 1:1, 2 Timothy 4:13). It is noteworthy that Paul reportedly decided that Timothy should be circumcised, according to Acts 16:3. Since Timothy had a Jewish mother, he too was considered Jewish under Jewish law (halakha). Paul's motivation for circumcising Timothy may be expressed in 1 Cor 9:20 where he writes: "To the Jews I became as a Jew, in order to win Jews; to those under the law I became as one under the law—though not being myself under the law—that I might win those under the law." Others believe that Paul's well-known animosity to the circumcision of Gentile Christians simply did not apply to Jewish Christians of whom Timothy was one, as was Paul himself. Still others consider Acts’ account on this matter to be fictitious, believing that Paul would never consent to having his protégé circumcised. Timothy is praised by Paul for his knowledge of the scriptures. According to a later tradition, Paul reportedly ordained Timothy as bishop at Ephesus in the year 65, where he served for 15 years. According to tradition, Timothy died trying to halt a pagan procession of idols as angry pagans beat and dragged him through the streets and then stoned him to death. In Eastern Christianity, Timothy (Τιμόθεος; Timótheos which means "he who honors God"), Saint Timotheos, as he is called, is venerated as a saint and martyr by the Eastern Orthodox Church. In the early days of Christianity, the author of 1 Timothy was considered to be Paul. Paul’s name, as the author, is cited in the text and for that reason—plus its theological orthodoxy—the early Church Fathers counted this letter along with the other 13 canonical Pauline Epistles as "undisputed." 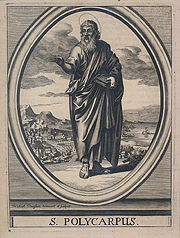 Saint Polycarp of Smyrna is posited by several scholars as the author of I Timothy. However, many modern scholars, beginning in the nineteenth century, have concluded that Paul could not have been the author. First, more than one-third of the letter's vocabulary does not appear in any of the other Pauline epistles, and more than one-fifth of the vocabulary does not appear anywhere else in the New Testament. However, two-thirds of this non-Pauline vocabulary was indeed used by other second century Christian writers. Also, such terms as "elders," "deacons," and "overseer" (bishop) refer to a church structure not yet in place during the lifetime of Paul, who refers in other letters to "apostles," "prophets," and "teachers" as the primary church offices. Each of these, to the "authentic" Paul is a charismatic office, endowed directly by the Holy Spirit and not to be any human authority or ceremony. Finally, the attitude expressed toward women in the epistle is distinctly un-Pauline. In virtually all of his other letters, Paul insists vehemently that salvation comes through faith in Christ, not works. He also insists that in Christ "there is no male or female." But 1 Timothy states that that women are to be subordinate to men, that they should be silent, and that "women will be saved through childbearing"—the exact opposite of Paul's usual insistence that salvation comes not through works but through faith in Jesus. Scholar Robert Grant, meanwhile, notes parallels to the early Church Father Polycarp of Smyrna and suggests that he, rather than Paul, might be the author of 1 Timothy. I. Howard Marshall also believes that Polycarp wrote 1 Timothy, placing its composition some time in the first half of the second century C.E. This would place the date for the epistle sometime around 140 C.E. Scholars who accept the epistle's Pauline authenticity admit that the language and style differ significantly from Paul's other letters, but explain this on the basis that it was most likely written toward the end of Paul's ministry, c. 62-67 C.E. The traditional view is that Paul wrote this letter to encourage Timothy to take on his own ministry at Ephesus, a church which Paul himself founded. Now that Timothy is pastoring the Ephesus church, Paul wants to encourage him to continue his good works. (Acts 19:10; 20:31). It is apparent that Paul is pleased that Timothy, his former student and travel companion, has risen up in the ranks of church leadership. Critical scholars have argued that the real purpose of 1 Timothy was to help the emerging Catholic church deal with many challenges to its authority and core beliefs, including the authority of bishops within the church. This sought both to honor Paul by using his name and attempted to invoke Paul's authority in asserting the author's own views about church order. False Teachings The author refers to "other teaching," (1:3) “godless myths and old-wives tales,” (4:7) "meaningless talk," (1:6) "blasphemous teaching," (6:3) and "myths and endless genealogies," (1 Timothy 1:4). The false teachings apparently relate to the theological basis of ascetic practices practiced at Ephesus, including abstinence from marriage and refraining from eating certain foods. The dietary restriction were apparently urged by Jewish Christians called “teachers of the Law” (1 Timothy 1:7), who advocated adoption of Jewish dietary laws. Paul gives to Timothy a warning not to let heresy and false doctrine take hold. "Myths and endless genealogies" may refer to gnostic beliefs, which often recited long lists of esoteric genealogies related to the origin of the universe and its various spiritual powers. 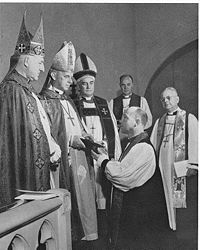 The authority of bishops is based in part on the tradition established in I Timothy, as is the tradition in some churches against women serving as priests or teachers. Church members Timothy is instructed on the principles pertaining to his relationship with the older members of the community. Rules are given for aid to widows (5:3-8, 5:9-16), the relationship between slaves and masters (1 Tim 6:1-2), the obligations of the wealthier members of the community (1 Tim 6:17-19). The letter also reminds Timothy of the prophetic character of his office (1 Tim 1:12-20) and encourages him to exercise it correctly (1 Tim 4:6-16). The Church must take care of widows if they have no family and are over 60 years old, provided someone has attested to her good deeds (1 Timothy 5:9-10). Men are instructed to take care of their relatives, especially their own family members (1 Timothy 5:8). Money is the Root of All Evil Yet, the "love of money as a root of all evil." (6:10) The author warns to guard against Christian leaders whose desire for money as their "false doctrines," "who are conceited," "have an unhealthy interest in controversies and quarrels," and "who think that godliness is a means to financial gain" (6:3-5). The writer boasts that he preaches "free of charge" (11:7) and is "not a burden to anyone" (11:9). Whether 1 Timothy was written by Paul or a later writer, the letter lays a foundation for various doctrines and practices dealing with the ordaining of elders and other church leaders (1 Timothy 3:1-7, 1 Cor. 3:8-13), the treatment of women, a warning against the teaching of false doctrines, and the doctrine not to let the desire for money corrupt church leaders. In essence, 1 Timothy has become a leadership manual for church organization and administration as well as a manual on church doctrine, and leadership. Protestants especially take the view that the letter's emphasis on hierarchy and its strong negative attitude toward female leadership in the church prove it cannot be truly Pauline, or that, if it is, then Paul's views on these matters are seriously out of date. ↑ Norman Perrin, The New Testament, an Introduction: Proclamation and Parenesis, Myth and History (Harcourt College Pub., 1974, ISBN 0155657259), 264-265. ↑ Robert M. Grant, Chapter 14: The Non-Pauline Epistles A Historical Introduction to the New Testament. Retrieved September 25, 2018. ↑ I.H. Marshall and P.H. Towner, The Pastoral Epistles (T&T Clark, 1999, ISBN 0567086615), 3. Grant, Robert M. A Historical Introduction to the New Testament, Touchstone, 1972. ISBN 978-0671214067 Retrieved September 25, 2018. All links retrieved September 25, 2018. History of "First Epistle to Timothy"
This page was last modified on 25 September 2018, at 22:00.